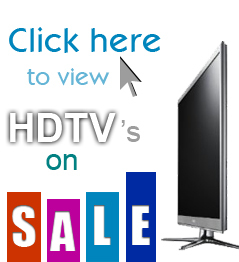 Your options are endless if you’re in the market for a new television without any restrictions. If you’re looking for a television for a smaller living room or a secondary room, you might find that your options are a little less plentiful. With so much of the market trending towards larger displays, you might find yourself having a difficult time choosing a set that will give you the features you want. We’ve stepped in help you narrow your options down. Everything from the display’s resolution to its refresh rate has been considered in compiling this list, but there is one thing that every set has in common: They’re all less than 31 inches. At this size, any of these televisions will fit comfortably in any living room, bedroom or man cave. Vizio has steadily increased their profile as a major manufacturer in the HDTV market, and this 26-inch beauty will only help their case. It includes Vizio’s Razr LED technology. This ensures that the set has the best brightness and contrast levels but still comes in a package thin enough to fit into any room. It has two HDMI ports and a remote with enough functions that you’ll probably never have to use the set’s built-in controls. Where the M261VP really shines, though, is in its Internet connectivity. The television is ready for Wi-Fi right out of the box and includes a number of built-in apps. These include Netflix, Twitter, Rhapsody and more. Other apps are also available for download. Wi-Fi is still something of a rarity in televisions of this size, so it’s great to see that Vizio decided to fill this gap for its customers. One frequent complaint that frequently comes up when discussing televisions below the 31-inch threshold is the relative lack of features that accompanies them. Most manufacturers prefer to put their best technology into larger sets, making it a struggle to find a smaller display that’s also full of features. Toshiba must have been listening to its customers base, because they made sure that this display had plenty of the latest technology inside of it. For starters, the set features a full HD resolution and an extremely thin profile. It’s the little features that make this set great, though. Toshiba’s DynaLight technology makes blacks deeper and makes the entire image smoother. A special gaming mode also reduces the delay between button presses on a controller and the response on the television, which is great if you’re planning to put this television in a game room. The set even includes two HDMI ports and USB port for maximum connectivity. The only thing we’re not crazy about is the 60Hz refresh rate. Then again, it’s a small sacrifice to make with all of the other features and such an attractive price point. At 22 inches, this set from LG is extremely portable and also very thin. The LED display provides a picture quality that is almost unmatched in comparable sets, with a 10,000,000:1 contrast ratio. The set’s 720p resolution isn’t quite as high as similar 1080p models, but on a 22-inch display the difference is virtually imperceptible. LG has also made it easy to set this TV up. It has a function that LG calls Picture Wizard II that lets you use on-screen reference points to calibrate the display’s color, tint and more for an optimal viewing experience. There is also a built-in sensor that automatically shifts the brightness of the set. This is perfect if you’re planning to use the television in a bedroom where you might have the lights on or off. Another quality Vizio set makes our list. As the name suggests, the E260MV makes use of an edge-lit Razor LED backlight. This lets the set provide a picture that’s rich in color and high in contrast, all while maintaining an ultra-sleek profile. The picture quality is no slouch either, as this set provides a full 1080p HD picture. It also features excellent sound quality, with SRS TruVolume and SRS TruSurround HD audio making the built-in audio experience more than acceptable. The set has two HDMI ports, so connecting an HD cable box and a game console or Blu-ray player is easy. The controls on the set are also touch sensitive, which is just one less mechanical part that you need to worry about. With all of this in its favor, there’s no reason that the E260MV shouldn’t be near the top of your list of televisions under 31 inches. This television set from Samsung has all of the features you would hope for in an HDTV. It supports full 1080p content and also has two HDMI ports built into it. While the 23-inch screen might not be as big as some of the other sets you’re considering, Samsung has managed to pack some pretty impressive technology into this set. It has a USB port, so you can simply plug in a flash drive and start watching movies or listening to music without going through the hassle of burning a DVD or connecting an iPod. A proprietary Samsung technology called MagicAngle also lets you adjust the viewing angles of the screen so that you can look at it from almost anywhere. Perhaps best of all, the set is also a monitor. That’s right, you can plug your computer right into this set and use your computer on a screen that’s probably quite larger than the one you already have. Even cooler, the T23A350 features picture-in-picture mode, letting you use your computer and watch TV at the same time.